Mayor Bill de Blasio’s ambitious affordable housing plan is put to its first test by the Astoria Cove housing project. The project is to receive its first progress report from the City Planning Commission tomorrow, September 29, at the wake of opposition from Queens Borough President Melinda Katz and concerns from Councilman Costa Constantinides (D-Astoria). The Astoria Cove has been proposed as a 2.2 million-square-foot project with luxurious high-rise buildings, housing 1,723 units on the Queens Waterfront east of 27th avenue. The primary developer is Alma Realty Corp, based in New Jersey. This is the first project under the mayor’s plan of 200,000 affordable housing units within the next decade. During Bloomberg administration, the zoning laws ensured that, to receive tax breaks and subsidies, the developers must have 20% below market affordable units. As for the new plan, the percentage is going to be set through Astoria Cove by the City Planning Commission. 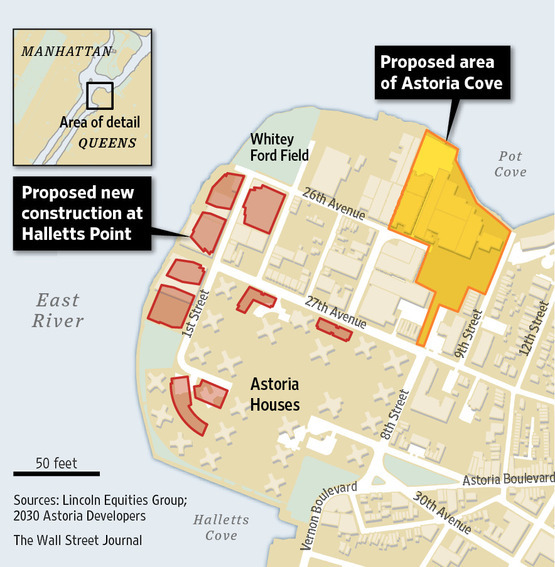 The current proposal of Astoria Cove has a 20% below market allocation from the developers. ”In terms of affordability, the middle class four-member families in Astoria make around 65 thousand dollars annually. If they are locked out from the development by rents like $2600 a month, I cannot support it,” said Councilman Constantinides. Lucille Hartmann, district manager of Queens Community Board 1 said, “We recently had a rezoning meeting for the Astoria Cove development and we voted against it. The intent was not that to say, no we don’t want it period, but we want it only if you take into consideration the middle class.” “We said 35% of affordable units,” she added. Besides affordability, another issue raised by the concerned authorities was community integration such as jobs. “It needs to be fully integrated to the Astoria community for me to support it,” said Constantinides. “By that I mean middle class Astorians can aspire to live and work there,” he said. “Local hiring has to be done during and post construction to create jobs for Astorians,” he added. Build Up NYC, a labor advocacy group, held a demonstration in front of the borough President’s office in August. Mike Halpin, a spokesperson for the group said on a telephone interview, “We want it to be developed responsibly. It has to be environment friendly, there should be respect for community and well paid jobs.” “We don’t want minimum wage jobs. These should have good training, benefits, security and needs to be sustainable even after development is complete. The whole idea is so that people don’t need to live in those affordable units at some point,” he said. Alma Realty Corp did not respond with a comment before the recommendation from the City Planning Commission came out on September 29. This decision from the City Planning Commission directing the fate of Astoria Cove is due to be announced tomorrow.